This topic has 28 replies, 23 voices, and was last updated 3 days ago by aphex_2k. My trusty pair of boots of 20+ years have finally decided to shed their soles! I don’t use them that often, so don’t want to spend loads on a replacement pair. Is it possible to buy something reasonable for say £50-£100?? Look at military issue boots. I have Haix British military issue boots, in both the Goretex combat high liability and the nubuck desert combat boots. By far and away the best boots I’ve ever owned – super high quality, don’t rub, clever lace lock system, mega comfy shock absorber soles, grippy. Better than my Altberg, original Brasher supalites and Meindl’s. Sorry – just had a look on ebay at the seller I got mine from – they had a sale on that has finished so they’ve gone back upto £40. Still an absolute bargain for that price though. How do they size up? They only have size 12 & 13. I am usually and 11 but wonder if a 12 with walking socks would be ok? The Haix are spot on size wise – the new boxed ones include a spacer that reduces by half a size when fitted. I use them with size 12’s as I’m a 11 1/2. I’ve always been a Scarpa fan. My current pair of Mantra pros are almost 19 years old. I have bought other Scarpas since as I get on so well with them. But recently I picked up a pair of Karrimor SF boots for work and I’ve found them to be very good so far. For the record I’m in boots pretty much all day. I an tempted to try the Haix at some point. Your current boots can probably be repaired or resoled. There are lots of places on the web, probably one near you. I work outdoors and do about 10 miles every day in mine. Comfy, waterproof, seem hard wearing. Dont forget to look at the weight of boots.. I recently got a pair of Aku Pilgrim GTX boots, which are the current military issue. They are comfortable straight out of the box They’re nice and light too. I paid just under £100. Same as i buy my running shoes – online. This is frowned upon by many, but it works for me, I stick with Asics for running and Scarpa for hiking, know my size – worst case scenario I need to pay return postage if they’re tight. Current scarpa boots were a psa on here over 5 years ago, best boots I’ve had. Mibbe even best footwear full stop!. Cost me 55 quid. Got some haix army boots. can’t be beaten for durability and price. Quite heavy and clumsy though. Salomon are good, nice and light not so durable but pricey as are north face. Scarpa and asolo are excellent esp for really mountainous stuff. I don’t buy leather boots anymore as they need a lot of care but will last longer. Theres a lot if good condition s-h stuff on eBay eg a pair of timberlands for £40. Budget of £50-100 will put you firmly in karrimor crapness territory. Look for a good brand discounted. Salomon is a good shout, but you’d be lucky to get 2 years out of them (if you actually use them), rather than 20. For longevity, My preference these days is to go for a full grain leather boot, and make a bit of effort to look after them (but I’ve had the most expensive brand boots, looked after as well as possible, fail within a year several times. If any fabric boot lasts 2 years, that is good going. How many times were your boots re soled in 20 years? There were a load of discounted Berghaus on Amazon a while back, I think they are Brasher boots rebranded after a buy out. Quite pleased with them for the £60 odd anyway. Not as sturdy as my trusty Zamberlans but also not overkill for dog walking. Waking boots you *have* to try on, with your walking socks on, and for a few more mins than normal for shoes. What foot shape are you? Suggest brands you find comfy. What distance walking do you do and on what terrain? I’m a slightly narrow fit, so get on well with Adidas and Salomon. Latest Salomon’s Alp-X mid were box open, so £90 on a £160 pair of boots. I do look like the Honey Monster in then though. I got a pair of boots from go outdoors, their own brand I think. Had them for 5 years or so now, been all over the Lakes in them and other places. Been fine for all but the nastiest boggiest conditions which would challenge any boot. Not really looked after them as such, a bit of a brush to get dried mud off but that’s it. Could probably do with a squirt or two of waterproofing spray. But for the price they been great. We’re not particularly comfy initially but i’ve Got freakily shaped feet and usually struggle with any Footware, nothing a good shaped insole doesn’t sort out. Yep my PSA, annoying I’ve discovered earlier today, the sole on one is trying to escape, really poor considering they’re my 2nd pair of (lighter) walking boots & really not seen a huge amount of use. Maybe I got a bad set? 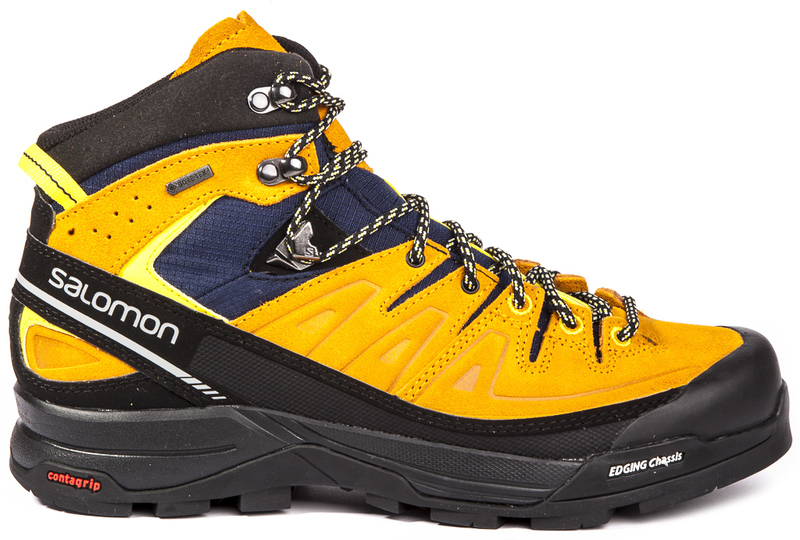 ^^ Salomon has couple of different fits, the yellow Alp-X boots above are “slim fit” in their terms. Just bought new boots, this time I took my time in fitting and choice was really different from initial expectations. I really wanted to get something else than Salomons but most traditional high-end boots just didn’t fit. 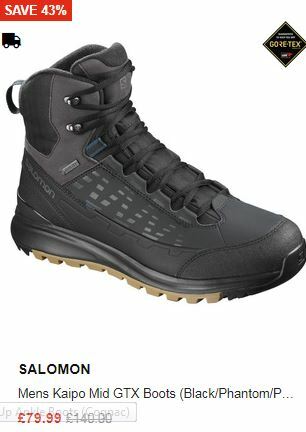 Salomon also has ‘military’ versions of some of their boots, biggest difference seems to be duller colours, closed lacing loops and different tread pattern. What are you using them for? I spend a lot of time in the fella and virtually never wear boots, except in winter icy stuff. That is a very valid question. But that’s just too much information dude. I spend a lot of time in the fella and virtually never wear boots, except in winter icy stuff. I’d prefer to wear trail running shoes as much as I can, and if walking the more popular better made paths, that’s fine. On unknown or less popular hills, it’s the boots, as there’s always bogs, and my Scarpa are like big wellies. Galloway hills are perma-bog, so never wear the trail shoes there!. Edit – also started using sticks this year too, should’ve used them years ago! So many positives, weight off the joints when descending/checking snow/puddle depths/walloping uncontrolled dugs. Win win. Anyone suggested SportPursuit? Salomon, Berghaus, Bestard, etc. and some top quality Scandi brands you won’t have heard of but are just as good. i didnt wanna spend much when i bought mine because i wasnt sure how much i’d wear em. that was 2 years ago, ive worn them to death and they are still going strong – cant justify a splurge on some fancier ones yet. For VFM I don’t think the Haix can be beaten, I too have a pair of the High Liability boots and found them comfy from the off. They do have quite thick soles and are a bit chunky so aren’t for everyone but are ten times better than some Hi Tec ones I had previously that were supposed to be leather but always seemed very plasticky(coated perhaps) and split right across the toes and mid sole. I wear a pair of undercarmour valsetz at work most days. Light, super comfy and pretty durable. Not goretex but I don’t need them to be. No issues with hot sweaty feet in Oz either.